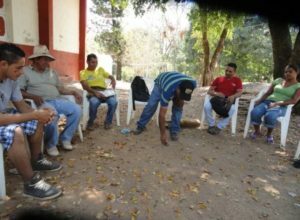 IP works with rural Salvadoran communities using a grass-roots development model by partnering closely with village leaders over many years. Local leaders identify community strengths and needs and then work together to design, propose and implement projects that will benefit their communities. Our Salvadoran staff facilitates planning meetings for community leaders as part of our CODECO (Construyendo el Desarrollo Comunitario) program. Over the years, CODECO has empowered communities to pipe water to houses, build and launch Community Education Centers/Libraries and launch businesses (e.g. establish an eco-tourism cooperative, construct a fish tank for a community fish business). Education Centers. In remote communities (known in the communities as the “bibliotecas’), where homes and distant schools lack books, IP’s community bibliotecas provides homework help, books, enrichment classes and access to computers and the internet. These Education Centers also become the center of the community where people have meetings and celebrations. Roads. In Hacienda Vieja a road was built to give access to houses that had only a foot path. 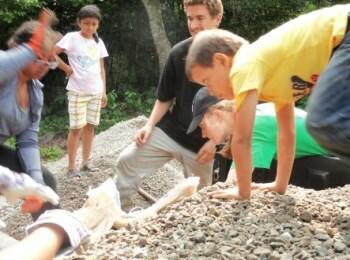 The dirt main street at the center of Cacahuatal was steep, rutted, and muddy in the rainy season until volunteers from IP and the community paved it carrying rocks from the river and embedding them in concrete. Ramps. Stairs and other barriers prevent some community members with disabilities from participating in educational programs and the social life of the community. As part of our disability initiative, communities are in the process of establishing ramps and making the education centers accessible to everyone. Technical Assistance. Remote villages often lack access to the knowledge and skills of a variety of professionals including special education teachers, hydraulic engineers, doctors, dentists, mid-wives, and agronomists. IP works to make such connections possible – from professionals both within and outside of El Salvador. Examples of other community projects have included our water projects, an eco-tourism cooperative, and a community fish business.